How Can We Help You On Your Agile Journey? Our Scrum workshops are interactive and informative. Master learning objectives as you learn by doing. Become a Certified Scrum Master or Certified Product Owner with our 2-day interactive workshop. 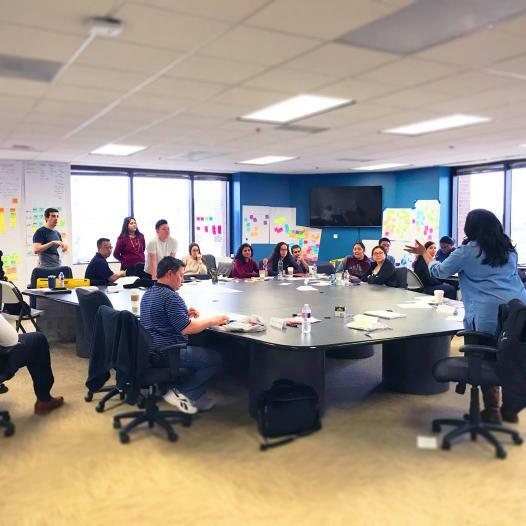 BeardedEagle offers Workshops and seminars that are recognized by the Scrum Alliance providing the necessary criteria for certification as a Certified Scrum Master and Certified Product Owner. We also offer LeSS and Saf(e) workshops. BeardedEagle offers private, customized onsite Agile and Scrum, Lean, Kanban and Six-Sigma workshops for groups of ten or more from their specialized corporate catalogue developed to provide agile lifecycle learning and techniques at specialized rates. BeardedEagle understands that organizations evolve around their culture and this is part of the process of an organizations evolution. We offer guidance and coaching around intentional change design to enable you to drive the change you want to see. The BeardedEagle difference is unique. We are serious about helping you become independent. Our goal is to equip you with what you need so that you get your rhythm and footing, so that you take your Agile journey in your stride. Whether you are a part of a start-up business, non-profit, or large global organization – we can help you succeed with the Agile framework that matches the DNA of your organization. We don’t do cookie cutter Agile. We listen and we dare you to reach your dreams of success. We work with you to custom map out your dreams and begin your Agile journey. Your success is our high-five moment. Get the benefits of the Agile Effect™ for your organization or department. BeardedEagle will help you eliminate the noise and get the results your organization desires. We have scaled Agile frameworks like yours. We have helped organizations adopt Agile frameworks like Scrum, which is the still the number one Agile framework of choice for over 55% of organizations today, with ease. We constantly help organizations go through full-fledged Agile Transformations. So, we know the hurdles that come with all of these paths and we will ensure you know them too. Let us guide you as you take your organization through this Agile Journey. BeardedEagle provides the bridge to take you beyond your current level of agile hiring experience. We bridge you from novice to masterful with our hiring toolkits. We understand how hard it can be to find expert Agile talent. BeardedEagle developed this service offering because we know it can be hard to read an Agile resume when you’re not familiar. So, we teach your hiring managers what they need to look for and the questions to ask. BeardedEagle has you covered for every stage of your Agile Journey™. Having the right talent to help your organization get Agile strong is key to your long-term success. We help you staff the right long-term Agile talent that complements your organizational Agile DNA. While you are searching for your next recruit, we will provide you with our on-demand expertise. We never want you without critical, just in time support. Why go to staffing agencies to find Agile expertise when you can come to your expert Agile Guides. Let us help you find the expert Agile fit for your organization. I took Devon's Certified ScrumMaster training in Chicago and it was excellent! Devon was extremely knowledgable and very passionate about Scrum. He kept the flow moving and there was never a dull moment. If you are interested in Scrum, he is the way to go. By the way, because of his class, I am now a Certified ScrumMaster. I am so lucky, that I worked with Mr. Morris in India. When he came to Mumbai & Pune for His CSM workshops. Lizzy was able to bring "real world" experience to the class, which does not happen often. Our class was relatively small and Lizzy was able to tailor it to our needs, so that we were able to get the most out of the class.